A very cool, spirited performance, nearing the end of the run for the Modern Guilt band. "Nausea" and "New Pollution" are an interesting combo--both become spacey funk rock songs on stage and go well together. "Chemtrails" and "Orphans" flow right into each other quite perfectly. 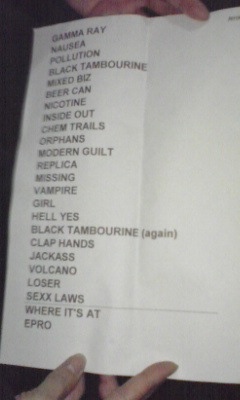 In fact the little Modern Guilt block of five songs in the middle of the set is pretty cool. Rare song alert: this is the third and final time they play "Vampire Voltage" (each time was in Japan on this little tour), and only the fourth time Beck played "Volcano." "Soul Of A Man," "The Golden Age," and "Timebomb" were not on the setlist image we have below, but they were squozen in and sounded great. Beck starts adlibbing a bit at the end of "Where It's At," instead of the usual "High 5" jeans jam he sings "Que Onda Guero." Then later during the end, he makes up some lines about "ET phone home / the fax machine is jammed" before dropping one line from "Bonfire Blondes" in there (the one about Japan). Beck doesn't talk a lot during this show, which is slightly unusual for a Japan show (esp. the other ones on this tour). He does tell the crowd they look cold, but notes that he does not have coats for everyone.